Situated in Southern Ontario’s Greenbelt, home to the Niagara Escarpment’s cliffs, the Oak Ridges Moraine’s rolling kames and kettles, fine farmland and several of southern Ontario’s most picturesque rivers, Caledon is a rural gem located within Toronto’s urban shadow. 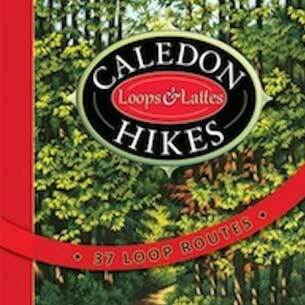 In Caledon Hikes: Loops & Lattes, Nicola provides detailed descriptions of 37 hiking loops that are a perfect way to spend an hour, an afternoon or even an entire day. Nicola’s carefully thought-out routes demonstrate her familiarity with the landscape and knowledge of what makes a good hike great. All of the routes described in this thoughtfully organized guide start and end at the same location. Sprinkled within her instructions is fascinating information about Caledon’s plants and animals, tidbits about its industrial past, and suggestions about where to top off your walk with a frothy café latte or an irresistible ice cream cone.